We stumbled across this image this morning. 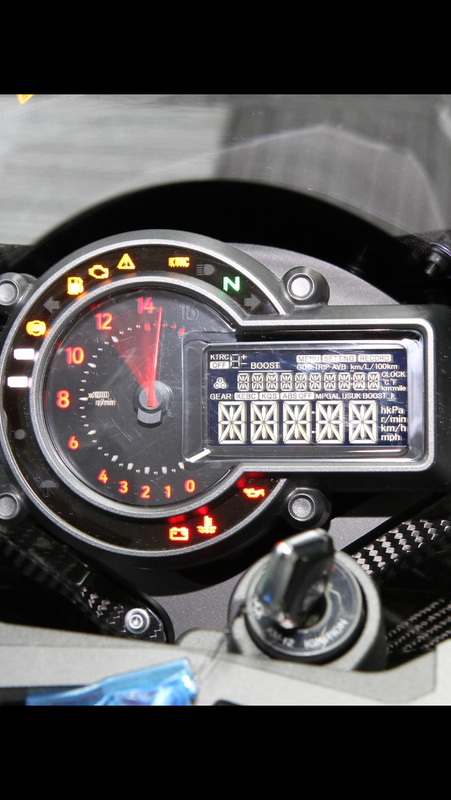 It shows the clock set on the Kawasaki Ninja H2R. It’s clear to see a couple of additions have been made to the standard Kawasaki offering on sports bikes. The first is the KEBC indicator. We’re going to go out on a pretty solid limb and say that this is the engine brake control indicator. Much like the Ducati Panigale, it would appear the Kawasaki will have some form of engine brake control. Whether you can just turn it on and off, or whether you can choose from multiple levels remains to be seen. We’re going for a four stage adjustable engine break control that uses the same controls to adjust as the KTRC traction control. Next to the KEBC indicator is the KQS. In every other manufacturers handbook, that’d stand for quick shifter, so we’re going to assume that the H2R has one of those as standard as well. Interestingly, with the indicator light and a couple of other icons showing, we’ll assume that this is the clock set for the road going version, rather than the track only H2R that was unveiled at the Cologne show recently. When you’re laying in B block doing bird for intergalactic speeding, picture this and smile. Over on the right side of the clocks, you can clearly see a bunch of icons that show you can have the economy displayed in US or UK mpg, but more interestingly, in the bottom right corner of the clocks, it looks to us like the rider can select between four separate display functions. MPH, KPH, R/min and hkpa. Yes, we wondered what hkpa stood for as well. Some time spent online showed that kpa is a standard indicator of pressure. One kpa is equal to 0.145 psi. Hkpa appears to be a term born from Japanese tuning lunatics Blitz. One hkpa (HectokiloPascal) equals one bar of lovely supercharged pressure. Goodygumdrops. If we’re clutching at straws, we could mention that the needle appears to have swung to at least 14,750rpm, which is a lot.